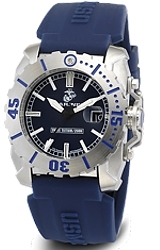 The U.S. Marines Blue Steel Dive Watches designed and developed by Wrist Armor for the U.S. Marines. This watch is tough enough for the United States Marines. 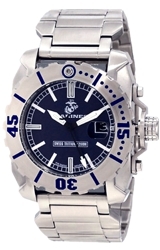 Heavy, solid stainless steel, water resistant and depth tested to 660 feet below sea level and tritium illuminated for high visibility underwater or in low light or total darkness. No buttons to push ever, tritium is self powered and will glow for 25 years!